"God is using Satan to teach us to overcome and conquer." Do we understand the power of decision? “What we do, who we are, where we end up—all are the visible evidence of what we have secretly chosen along the way. Free will is a gift given only to mankind, but it is a gift so absolute that God Himself will never take it back. He will rule and He will have the last word, but He will never make your choice for you. You choose. You will choose. “When the Lord reveals His will and His standard, He calls for decision. The Lord Jesus wants agreement, not acquiescence. He seeks a willing partner, not a mindless slave. Ever He is inspiring a love relationship, and this is the privilege of entering fully the adventure of life with Christ…by delighted choice! 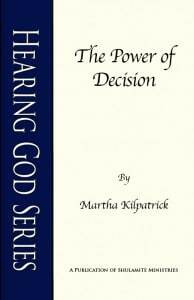 In this booklet, Martha explores the power of decision and shows how God limits Himself to work in our lives based on our decisions. “David formed his life by deliberate choice, according to the standard of God. He made decisions in the midst of difficulty and unspeakable pressure; he made decisions unto the Lord, before the Lord alone! The Power of Decision is now available in both print and digital format. Those two trees stand eternally for humanity’s free choice: the gift of God to us. The Lord God told the man which tree not to eat, and the consequences if he did. “…for in the day that you eat from it you will surely die” (v. 17). In His perfect integrity the Creator named the stark choice: Life or Death. Free will is the basic feature of the human soul, a gift given only to mankind, but a gift so absolute that God Himself will never take it back. He will rule. He will have the last word…but He will never make your choice for you. You choose. You will choose. Oswald Chambers wrote: “Will is the essential element in the creation of man. I cannot give up my will. I must exercise it.” Moses defined the choice again as between life and death. And every choice is a matter of life or death…that crucial, that drastic. Choice ever stands before us, daily confronts us and we choose! We do. We constantly choose. The smallest act of life begins by a choice. Heaven and earth bear the weight of our decisions! I know a follower of Christ who always says, “The choice is between heaven or hell. So for me, there is no choice. Who would choose hell if they understood that was the real choice?” Knowing what constitutes the real choice…that is the issue. Human existence at its most basic level is an individual choice between life and death. She said, “Yes. Be independently dependent on Jesus Christ.” Now that sounds like a contradiction, but it is very profound. You must gain your autonomy, your self-determination,so that you can yield your will fully to God. Simply put, that means you must recover your NO, before you can exercise your YES. Independence is freedom from external control or influence, to choose the place of your dependence. For most of us, all our lives others have been trying to make our decisions for us. Some of us have been completely run over. Others are hopeless and feel that their decisions make no difference and have no power. Most of us have blurred lines of choice and obligation. The Lord challenges us to gain back our autonomy, so we can live fully in our own gift of choice. The Holy Spirit differentiates between your responsibility and everyone else’s. Friends, it can be a long work! It is very difficult for some of us to understand our autonomy, our personal and individual power to say NO and to say YES. Autonomy is the ability to choose for myself, free of any outside pressure. My independence must be gained so that I can give my dependence to the Lord. Independent first. Dependent second. So we have to recapture the NO that may have been crushed. Until you have your NO, you will not have your YES. The fishermen by the Sea of Galilee heard Jesus say, “Follow Me.” Their decision was so powerful by having seen and heard Him, that immediately they left all and followed Him (Mt. 4:18-22)! YOU possess the power to know and experience God, to live fully your spiritual destiny. God has a purpose for your being here…and you can find it. The unfolding discovery of your destiny rests upon your trammeled decisions. One by one. When I speak about the power of choice, I often hear this: “I don’t know how to make the choices.” Even when I demonstrate that we make choices constantly, with our volition at work and fully active, the person focused on HOW remains bewildered. HOW is not really the question. It is the question to avoid the question. We choose. We choose to believe something or not believe. We choose our actions and our attitudes. We choose not to do or we choose to do. Every word and act of life is preceded by a decision. The question “HOW do I choose?” is often the indication that I have already refused to choose Christ. I don’t WANT to follow Him, so I have to make it hard, confusing, and obscure so that I can be excused. The issue of decision is not HOW but WHAT. What we want to do, we manage to do. What we desire, we pursue. Here is the “IF” again. IF you want Christ, you will choose Him fully. So the compelling factor of choice is desire. If you want to choose the Lord Jesus, then pray to SEE Him and your desire will happen. We have the power to choose what we want and even to choose to want what God chooses. In other words, we can choose what we don’t want. Your surrender to God’s will is the death of yours. Jesus was the Only Begotten Son but He was also fully human. As such He had the right of free choice and He had to surrender that choice voluntarily, with full agreement to God’s will. Gethsemane was the fight between Jesus’ natural desire to avoid suffering and God’s will. Jesus’ great war to surrender was against Himself—for God. Though Jesus’ surrender cannot be compared to ours, if you have ever fought your own wishes and given them away to God, then you understand a little about the principle of Gethsemane. Our Lord was praying His choice, battling to overcome His feelings and His thoughts. He was saying, “I will do it if this is what You want. I will do it! I will do it! Not my will, not my will, but Your will.” It was a peek into His anguished cries to the Father. Have you experienced the agony of surrender? Do you fight your feelings and thoughts to surrender your will to God’s will? The Gethsemane experience is a wrenching work we all must do. Because we are truly free to choose, and there is within us from Eden a raging battle to oppose God’s will—a relentless drive in the human heart to have its own way. From that blood-spilling hour of surrendering His will, Jesus stepped out in absolute peace and dignity to be arrested without protest. He was not subject to His accusers or…His tormentors. Christ was no pawn of darkness and no victim of God. He was a volunteer! God’s Kingdom consists only of volunteers.